True Friends Are Rare! None Like Mine! True friends are rare! I mean the kind of friend that let you know when you act like a jerk. A friend that knows you more than yourself. How possible is one to know another more than themselves you may ask. Friends, praise you, support you, defend, encourage, comfort, and just love you and want you to be happy. However, there is a limit to what even the closest, kind, faithful, and loyal friends can be to you at every stage of life. The best of us are prone to error, that is just who we are, our perfection is in Him alone. I want to talk about a special friend and confidant that I have. He is the truest of them all, constant, steady, faithful, loyal, dependable, reliable, true and loving. My special friend does not mince words with me. He tells me things as it is. He has never betrayed me except to myself, taking my lies and revealing the truth of it to me -convicting me thereby. Never demanding except to request I be the best I can be, to do unto others as I would like it to be done to me. My friend act as a sounding board to me sometimes, like when I say something not too nice and I hear it played back. You know what friends? We all have some friends that will nod at every word, agree with any idea just to be in our life. Not this my very special friend and I am grateful for having Him in my life. My special friend is the Holy Spirit. He let me know that it is Him that has kept my secret secret, so that I do not go around telling tales and reveal others secrets. My friend let me know when my criticism deviate from constructive to destructive due to my own jealous and envious heart. When the discussion moves from the subject – topic of discussion to the object – the person. Do you have this friend in your life? A true friend that will let you know you have deviated from the path of truth, living in error, and show you a way back into the light of God’s countenance. True friend that will direct your path and safeguard you in treacherous terrain. A true friend that stir you to do the right thing amidst contrary opinion, a true friend guarded by truth, love, compassion, justice, and a sound mind. It was this friend that instructed Abigail to make haste to appease David – 1 Samuel 25, directed Tamar to take Judah’s seal, its cord, and his staff – Genesis 38. It was this friend that helped Ruth though in pain, sorrow of heart, to see Naomi’s loss and pain and, decide to accompany her on a journey to a strange land – Ruth 1. It was this friend, unseen, but His presence was felt powerfully, he guarded Rehab’s heart aright to help the spies – Joshua 2. Do you have this friend in your life? You must be born again to have this special friend. You must accept Jesus Christ as your Lord and Savior, forsake all your evil ways, confess Jesus as Lord and cultivate the presence of the Holy Spirit, the Spirit of Truth. No better friend than Him!!!!!! The person without the Spirit does not accept the things that come from the Spirit of God but considers them foolishness, and cannot understand them because they are discerned only through the Spirit -1 Corinthians 2:14. “You see young lady, I knew there was something about me as a child” said My lady. “I realized much later in life that I was a very special child’. ‘My parent did not know or maybe they knew. They are long gone now, or I would have asked them” continued my lady. 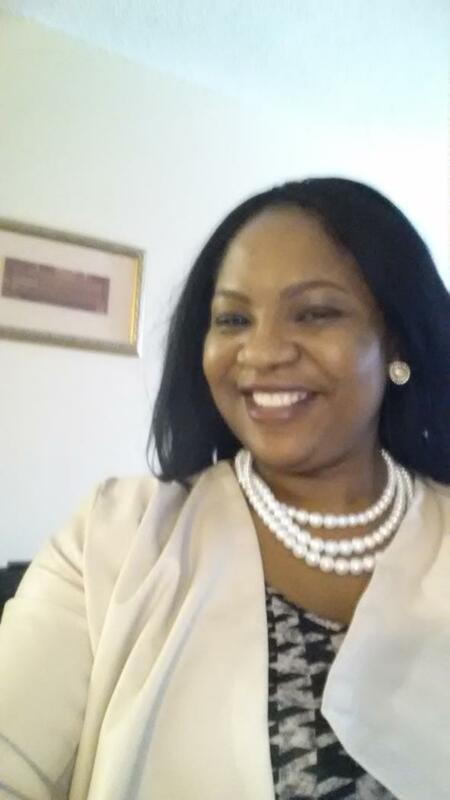 “I am glad of the mercies of God upon me and mine. I rolled my yes and spluttered, having more questions per second than my lips could say. What experiences? Mystery? A hundred years old? You’ve had a beautiful life, with all the adventures I read about in your memoir, shouldn’t you be ready now, haven’t seen it all? “I have indeed had a beautiful life”said my lady.”I am one of the few blessed ones, living out my days in peace, joy, and divine health. The Most High has been good to me.” Obviously one day soon as the Lord wills, said my lady as she looked on, as if looking into eternity, with a radiant countenance. Love In The Wilderness! Awakened! To Obtain Your Deliverance! It Is A Small Thing With God!! Even Now!! This was David speaking to King Saul. He had come into the camp and heard the threat of the Philistine. David was but a boy, too young to be drafted into the army. He brought supplies for his brothers and could not help but hear the taunt of the Philistine. I must do something, he must have thought. David decided to step out of his comfort zone to face Goliath. He knew His God will always back him up, and even if he does not? This wasn’t a thought in Davids mind. He knows God will always show up!!! He always does! Never late!! Friends, I don’t know what Goliath – Philistine represent in your life. I don’t know what the Lord had done before in your life. The Lord had rescued me from storms, trials and tribulations many a time. The Lord had and is shielding me and mine from the fiery darts of the wicked one.Whatever the Lord had done before, He can do again! Lord we thank you for your mercy, your goodness, and faithfulness. Your are so dependable Lord Jesus. Father Lord Almighty, we know it is a small thing for you to deliver us yet now from insufficiency, lack, stagnation, poverty, barrenness, loneliness, and fruitlessness. Father deliver us from the bed of affliction, deliver us from the oppression of wickedness, let your power manifest in us to destroy every works of Satan. May your name be glorified in us Lord in Jesus mighty name. Amen. Friends Or Foes? How Can You Tell? Be Discerning And Cautious! Friends, your adversary, the devil, though he goes around looking for whom to devour, will not present himself as an enemy. The wicked will often come dressed up like a friend, someone reliable and dependable. They will come to you at a time you need a friend, maybe a helping hand, a shoulder to lean on, or just a listening ear. Like the scripture stated, the wicked will always hear and have information for, like a dog they sniff and always have their ears to the ground, eavesdropping on your case. They will suddenly show up, summoned by the insatiable desire to hinder and turn upside down, that which is meant to be upright. May the blood of Jesus prevail against such in your life. Zerubbabel and the others were able to discern that these people are foes and not friends as they made themselves out to be and they were right. Friends, if you read further to chapter 6, you will know the extent to which they opposed the rebuilding of the temple. Likewise are those that have presented themselves to you as friend, team member, working for the same course but are indeed actually sabotaging what you are working for. These are those standing against your peace and joy, promotion, fruitfulness, lifting, breakthrough, and increase. Those stationary, going no where, blocking your way – may the hand that is not of mortal uproot them from your path in Jesus name. See friends, Satan is a spirit and require bodies to carry out the task of hindering the plan of God for His creation. When you see someone, groups opposing a good course, just know they have been taken over by contrary forces, it is beyond them par se. You have to engage The Spiritual in order to effect a change in the physical. Like the sermon this past Sunday. Saul was already in his palace, yet he left the comfort and honor of the palace to seek for David in the wilderness rough terrain. Don’t you dare underestimate the extent the wicked will go to in order to cause you pain! Satan is not playing, you also have to sit up, get up and deal!!!! You will make them turn their backs when you aim at them with drawn bow -Psalm 21:12. Arise and take up the battle cry!! The Spiritual controls the physical my friend, so engage putting on your armor. Ephesians 6:12 For our struggle is not against flesh and blood, but against the rulers, against the authorities, against the powers of this dark world and against the spiritual forces of evil in the heavenly realms.13 Therefore put on the full armor of God, so that when the day of evil comes, you may be able to stand your ground, and after you have done everything, to stand. 14 Stand firm then, with the belt of truth buckled around your waist, with the breastplate of righteousness in place, 15 and with your feet fitted with the readiness that comes from the gospel of peace. 16 In addition to all this, take up the shield of faith, with which you can extinguish all the flaming arrows of the evil one. 17 Take the helmet of salvation and the sword of the Spirit, which is the word of God. 18 And pray in the Spirit on all occasions with all kinds of prayers and requests. With this in mind, be alert and always keep on praying for all the Lord’s people. Engage boldly, standing against the onslaught of wickedness!!! Set your eyes on the reward. Lean on the Lord and hold unto the promised Holy Spirit to lead and guide your every step. You will not shipwreck. You shall finish well for God will always make a way of escape for you to riggle out of the clutches of distractions. Trust in the Lord! Selah! Isaiah 56:4 For this is what the Lord says: “To the eunuchs who keep my Sabbaths, who choose what pleases me and hold fast to my covenants – 5 to them I will give within my temple and its walls a memorial and a name better than sons and daughters; I will give them an everlasting name that will endure forever. The Lord is saying to you friends, that no matter the situation and circumstances of your life, as long as you believe in Christ Jesus and live in obedience to His will, precept upon precept, He himself, The Most High God will give you a name that will endure forever. Isn’t that something? 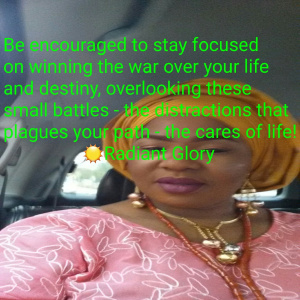 You should be encouraged to stay focused on winning the war over your life and destiny, overlooking these small battles – the distractions that plagues your path – the cares of life!